Lion Bear Naked Soap Co. founders Alex Schreiber and Jason Schreiber, left and right, shown with employee Chris Klabunde, center, and daughter Ally. Photo courtesy of the Schreibers. Five years ago, a Denton couple developed cleaning formulas that are safe for people and the planet. Thanks to a whimsical name and a ultra-green business model, today their company's future appears to be growing brighter. Jason Schreiber and wife Alex Schreiber founded the Lion Bear Naked Soap Co. in 2013. Jason says that both he and Alex came up with the tongue-and-cheek name of their eco-friendly business. While the Schreibers still maintain full-time jobs outside the company, business has been so good, they recently a hired part-time employee Chris Klabunde to help. 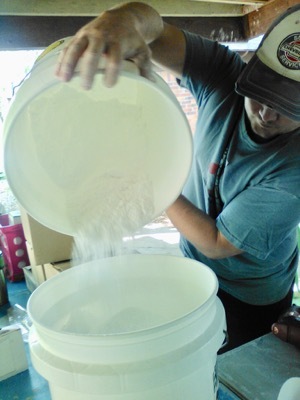 Jason Schreiber pours laundry powder. Jason said the company grew out of a personal commitment to improve their health. As a result of their scrutiny, they found that a lot of chemicals in body care, i.e. home cleaners, cosmetics, etc., contained damaging toxic ingredients. Alex had graduated from Texas Women's University with a double major in kinesiology and science. She had taken a lot of organic chemistry classes and so was comfortable tinkering with formulas. Today, the Lion Bear Naked Soap Co. sells a full line of multi-use soaps, body washes, spray cleaners and laundry powder. Every product is a nontoxic, vegan, grey water safe, nut oil free and environmentally friendly formula. Their most popular product is the unscented laundry powder, loved by young families. “It’s selling so fast that we can’t keep it on the shelves,” Jason said. The No. 2 seller is Sunflower Castile liquid soap, which can be used as a hand soap, carpet cleaner, vegetable cleaner, etc. Products are sold at LionBearNaked.com, as well as at farmers markets and through Dallas-based online retailer PureLivingSpace.Com. 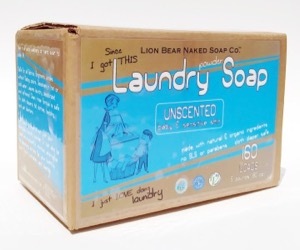 The Lion Bear Naked Soap Co. scored a critical green industry rating with a listing on the California-based nonprofit research company Environmental Working Group site. The site rates products on toxicity levels and the Lion Bare Naked products received the lowest hazard rating. Jason also points out that their products are never tested on animals. All of the manufacturing, packaging, graphic design, marketing, sales and even the scoops are made at their Denton headquarters, which has been zero waste since they began operations. While they hope to package their products in compostable bottles someday, Jason says that their biggest goal is to get Lion Bear Naked Soap Co. into a dedicated solar factory space.